Eaton BWH Type B2 main lug load center has 24 circuits with 1-Inch space. This 1-Phase main lug load center has a voltage rating of 120/240-Volts AC, current rating of 200-Amps and an interrupt current rating of 25-Kilo-Amps. It features 3-Wire configuration with insulated or bondable split neutral connection. The load center has NEMA 1 indoor rated, rainproof metallic enclosure with electrostatic powder-coat and baked urethane paint finish for added safety, strength and durability. It has tin-plated aluminum winding and aluminum bus cable of 1-AWG-300-KCMIL copper or aluminum conductor for efficient performance. 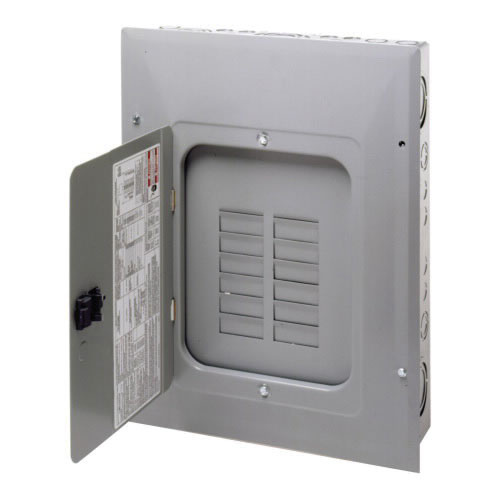 The main circuit breaker load center includes combination cover and BREQS125 hold-down screw for added protection. This load center measures 14.31-Inch x 3.88-Inch x 18.75-Inch. This load center is suitable for use with type BR 1-Inch breakers. The main lug load center is UL 67 and UL 50 listed.